The collective cry throughout India of "Jai ho" (May you win) received a resounding answer when composer A.R. 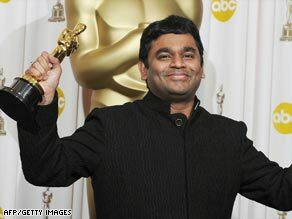 Rahman took home two Oscars for the movie "Slumdog Millionaire." Rahman’s wins — one for the song “Jai Ho” and the other for Best Score — were just two reasons for Indians to erupt in boisterous celebrations Monday morning. “Slumdog,” which was shot in the streets and slums of Mumbai bagged eight golden statuettes in total, including one for Best Sound Mixing. Indian Resul Pookutty shared it with fellow sound editors who worked on the film. Documentary “Smile Pinky,” which was made in India, added icing to the cake, taking home the Best Short Documentary gong. It tells the story of a young girl from Uttar Pradesh who undergoes surgery to fix a cleft lip. Watch CNN’s Malika Kapur report on the mood in India from Mumbai “This is the finest hour of Indian cinema in the global scenario,” said Anand Sharma, the country’s junior external affairs minister. Indians crowded around television sets in dorm rooms, restaurants and homes, exhaling in relief as Rahman’s name was announced as the winner. They high-fived each other, hugged, shrieked and wept. “I cannot describe this feeling,” said Nikhil Jyonti, a Mumbai resident. “I’m bursting with pride for India.” In the Mumbai slum of Dharavi, where many of the scenes in “Slumdog” were shot, a television was set out for the street children to watch the ceremony. Few in the teeming slum of one million people had heard of the Oscars, but they knew Rahman’s win was a source of pride for the country. Danny Boyle’s rags-to-riches film tells the story of a tea-boy at a Mumbai call center who earns a spot in the Indian version of the quiz show “Who Wants To Be a Millionaire” He raises the suspicion of the show’s host when, despite the lack of a formal education, he begins to answer the increasingly difficult questions with ease. The movie also won four Golden Globes and a host of honors at other award shows. While the overwhelming sentiment was one of pride Monday, the movie has faced backlash from many Indian movie critics who took exception to its depiction of Mumbai’s underworld without highlighting any of the city’s achievements. Among the most notable criticisms was one offered by Amitabh Bachchan, considered the most successful movie star in Bollywood history, and a former real-life host of the Indian “Millionaire.” The film,” he said, “projects India as the third world’s dirty underbelly … and causes pain and disgust among nationalists and patriots.” But most Mumabikers, still reeling from a terrorist attack in their city in November, embraced the movie while looking for something positive to root for.